The Road to the Horizon: Holy Condoms! 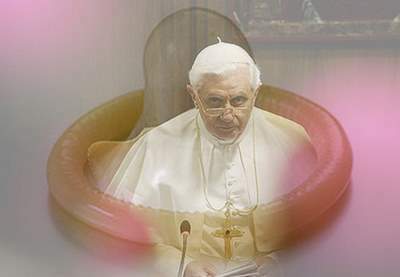 Health workers beg to differ with the pontiff. The UN rather explicitely rebroadcasted their stand: "Condom use is a critical element in a comprehensive, effective and sustainable approach to HIV prevention and treatment. Prevention is the mainstay of the response to AIDS. Condoms are an integral and essential part of comprehensive prevention and care programmes, and their promotion must be accelerated." Sub-Saharan Africa is the world's most heavily affected by HIV, accounting for 67% of all people living with HIV and for 72% of AIDS deaths in 2007. 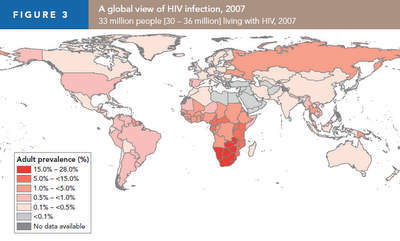 Map and statistics from the latest UNAIDS report on the AIDS epidemic.